Creating a term sheet is the exciting culmination of a long journey toward funding your startup enterprise with the fuel necessary to drive it to the next stage in its development. If an innovative idea is the engine of growth for a startup venture, then financing is the fuel that keeps the engine running. 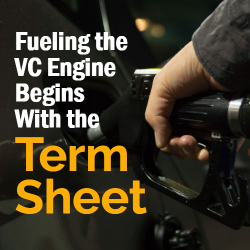 The term sheet defines the price of the financial “fuel,” how much of it will be provided by the venture capital (VC) firm, and the conditions attached. Every business endeavor starts with that gleam of confidence in the eye of the entrepreneur who believes he or she can make substantial money from developing an idea into a successful company. But beware: Negotiating from a weak or uninformed position can leave the company with a suboptimal valuation, onerous obligations to the investor, or diminished control over the future of the business. VC investors or individual investors are prepared to risk their own and their investors’ money to create value. Every entrepreneur needs to understand how to create that value in a manner consistent with the investors’ view of the business. The funding journey is based on milestones: from coming up with the idea, to understanding its value proposition, to moving it from ideation to the prototype to actual customer adoption to revenue and eventually cash flow. The entrepreneur goes into the office thinking about working in a smooth continuum toward these milestones, whereas investors are only interested in the entrepreneur achieving the milestones. At each stage, reflect on what valuation you have created. Only then approach investors armed with the knowledge of what you’re worth, and be prepared to defend it. As you start this journey, here are recommendations on negotiating a term sheet in a manner that will be equitable for both the startup and the investors. The startup should establish a well-defined process to generate a term sheet. Since every startup is different — as is every investor — customize the process to the specific needs and circumstances of the business. Key steps in any process will include sending investors a “teaser” — generally a one- or two-page document offering a first look at the investment opportunity and explaining why it is strategic. Next, obtain a nondisclosure agreement, provide a confidential information memorandum, and establish a data room so the investor can conduct due diligence. Rather than simply asking investors to provide a financing bid by a certain date, this process helps avoid the risk that no bids emerge, or that an investor may hold off on bidding until the last possible moment and thus put the startup in a “take it or leave it” position. The most important aspect of the term sheet is the valuation placed on the business prior to receipt of financing, or the “pre-money valuation.” It is a rule of thumb that startups always think their company is undervalued, while investors always believe the exact opposite. Have a strong rationale for the valuation. Learn how comparable businesses are valued (for example, as a multiple of projected revenue or EBITDA, discounted cash flow, etc.). Resist the urge to make overly optimistic projections about revenues or profitability. A failure to achieve these goals risks alienating investors in subsequent financing rounds. Understand what exactly has been invested to date (excluding sweat equity — that doesn’t count; intellectual property counts only if it generates cash flow or is enforceable in litigation). Understand how new investors will achieve their returns. Pure equity risk trades at a 30% internal rate of return, calculated over a three- to five-year period (how a new investor will get triple its money back over that time horizon). Do not overlook the value of enforceable intellectual property rights in arriving at a pre-money valuation. Consult an advisor with expertise in this area and be prepared for pushback. After the process, you will know what you are defending and why. Another vital element in the term sheet is the type of investment instrument, such as preferred shares or convertible debt. The type of instrument will impact the company’s financial flexibility and can affect the dilution of its founders’ stakes. Similarly, give strong consideration to terms such as dividend rates on a preferred instrument, or whether the dividend is cash or paid-in-kind. Typically, a term sheet will lay out certain rights of the investor. One right is the number of seats the investor will have on the board of directors. A new investor will often require one or two board seats to monitor the investment. Alternatively, they will require a board seat and an observer seat. Term sheets also can contain provisions such as the “drag along,” which would force minority shareholders to sell their stakes if the majority shareholder does so. But there is also the “tag along,” which gives minority shareholders the right to join a deal if the majority shareholder sells his/her stake. Although the specific clauses in the term sheet are important, another significant consideration is what type of investor — financial or strategic — is best for the startup. One school of thought favors financial investors, as they provide funding but are less likely to become deeply enmeshed in operations. 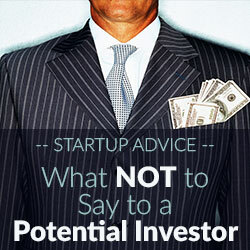 Also, a financial investor may be preferred, as a strategic investor may eventually compete with the startup. On the plus side, a strategic investor may be able to bring relationships and hands-on operating experience, and thus could be a valuable partner in accelerating the growth of the company. 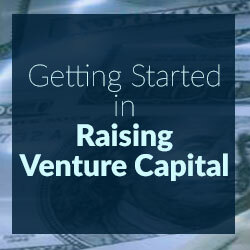 Many entrepreneurs don’t think about their use of proceeds at the outset, but it is critical. No new investor wants to overly enrich previous investors at the time of the investment; they want all investors’ interests — legacy and new — aligned around remaining invested and all pushing toward a prosperous future monetization. Repayment of debt — especially insider debt that is really more like equity — can take place in very limited quantities. Investors are very interested in the “capital plan” for the proceeds to get the company to its next milestone, however that is defined. Many young companies have grown up from one round of investors to the next, with often confusing and conflicting ownership and governance. This confusion can and should be clarified in a major round of investment so the capital structure is simple to understand. Few investors are interested in tax-advantaged entities such as an LLC, LLP, or Subchapter S, so you may need to convert to a C corporation that is taxable. Even with the Tax Cuts and Jobs Act of 2017’s lower corporate tax rates this is something that will be a new line item. The new investment will likely come in the form of a security with a preference — preferred or debt — so the new money is protected against the downside in a liquidation and has leverage over the common in the event operations fail to support a payment of a dividend or an interest payment owing. The preference will look like a fixed-income instrument but it will behave like equity in terms of its dilution, usually by adding a conversion feature or warrant coverage. What to do with that dividend or interest payment is a challenge since you don’t want a perpetual obligation against your cash flow. Often term sheets call for a conversion at the option of the investor, as well as a conversion into common stock that can be forced by the company after a certain period of time or achievement of a milestone. Apart from financial terms there are myriad operating terms that will grant the new investor certain veto rights to defend its position. These usually revolve around a major capital event, such as declaration of a dividend, sale of the company or a major asset, an acquisition, or a dilutive new financing undertaken at a lower valuation than the previous round of financing. Finally, there are some features that can damage a company. Examples include “death spiral warrants,” resets or increasing rates on debt instruments, and hypothecating the company’s major asset such as its intellectual property. The term sheet is usually nonbinding on the investor, but will require the company to wait out a due diligence period of 30-60 days while a definitive agreement is drafted. The company needs to trust the investor, making sure there are few, if any, contingencies — such as a financing condition — that could derail a smooth closing. The term sheet is a placeholder that has the benefit of outlining the terms that both sides will pursue to close in good faith, but the company has granted a one-way option that could result in a broken deal. A broken deal is frustrating. The startup has to begin the process all over again. It might also have lost interested parties that were rejected earlier. Out-of-pocket expenses are also a drag on precious capital. Remember: Don’t run the tank too low before starting the new capital raise. It is very hard work and takes a lot of time. 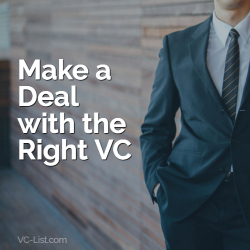 While there are many factors to consider in negotiating a financing package for a VC investment, it is clear that fueling a startup’s growth engine begins with creating the right roadmap— the term sheet — for the financial relationship. You have to create a human problem fixed, a human need satisfied, a human spirit kindled. The principals experience with failure and what they plan to do if this doesn’t work. Bring hard evidence: contracts with customers, letters of intent, memorandums of understanding, and other formal documentation to show customer interest. Talk about supplier relationships, history, stability, scalability. Failure might not be your fault but equally, you need to have both preventative and contingent actions in place for obstacles that arise from your relationship with your suppliers. Proprietary intellectual property, demonstrate trademarks and patents. Sustainable competitive advantage, where is your evidence? Can your investment proposition be tailored to suit the audience? Investors come in different shades of grey, your flexibility is paramount to drawing them in. Exit strategy, what is it precisely? Common shares convertible to preferred shares if targets aren’t met. Industry specific risks: government and political risks, regulation, distribution, security criteria, foreign interests and so forth. If the mere thought of generating this information leaves you cold or exhausted, you can confidently rule out soliciting help from or expecting support from venture capital firms.